While rebuidling and updating the Ajax, I've been applying the same tweaks to the Santee as well. 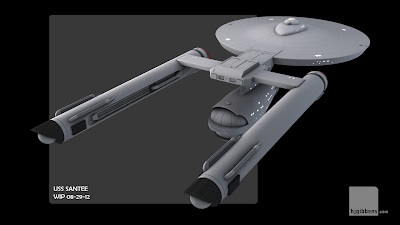 The primary hull and nacelles are a direct lift from the current iteration of the Ajax, the dorsal and secondary hulls are new builds with the more subtle paneling effect. I have also changed the way I do the windows - they now have slightly rounded corners as well as a slightly bevelled inset which seems to give a better shadow effect compared to the previous harsher, square insets. That looks great so far. The design is really cool. 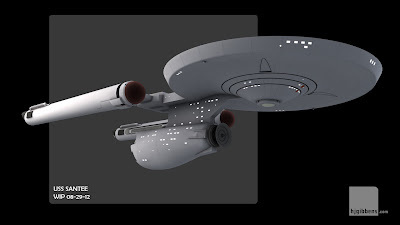 Did you design the ship or is it someone else's design? Thanks EG. 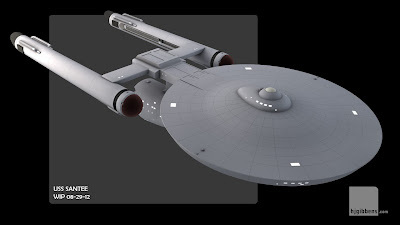 Sadly, I can't claim credit for the design - that belongs to Mark Wilson, over at Federation Frontiers. Yeah, I actually answered my own question after you updated your thread at 3DSciFi. I knew that at one point, but I'd forgotten about it even though I like it.